Coming up with the most attractive backyard landscaping designs might seem daunting. However, landscaping your backyard is not actually as overwhelming as what most people think. So if you are in need of some inspiration to design or landscape your yard, here are some design inspirations to consider. One of the easiest ways to design your backyard is to install pavers. In fact, you can convert a dull looking garden path into a charming mini patio by simply installing flagstones in it. You can add more patios and separate them with clusters of thick turf. These backyard pavers have two functions. First, they act as a functional walkway. Second, they are huge enough to handle enough seating outdoor for gathering of friends and loved ones. This rustic inspired rock fountain can serve as a charming focal point in your backyard. Additionally, the relaxing sound of the running water will surely be a delight for those who love outdoor naps. Surround the fountain with pebbles and grow thick turf in the rest of the areas in your backyard as well. As always, first impressions count. There’s nothing that can ruin a view faster than an old rusty gate with muddy path in your yard. Therefore, if you want to create a good impression on your backyard landscaping designs, come up with a charming entrance into your backyard. 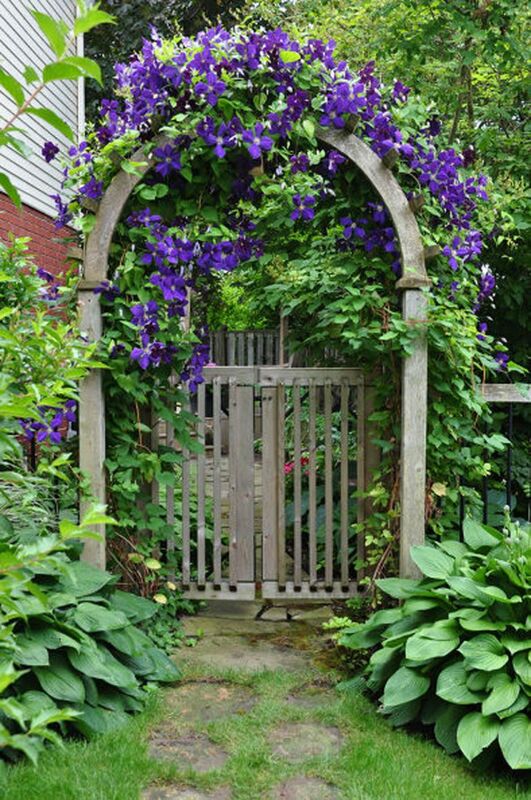 For instance, the wooden gate above has looked even lovelier when draped with purple flowered vines. Finish the look by creating a cobbled stone walkway that leads to your backyard. One of the easiest landscape design ideas that can make your backyard to stand out is to install a sleek patio set right in the middle. Simply think of a color theme for your landscape design then choose a patio set that you think will complement it. Here, a wicker patio set with white upholstery looks great in this nature inspired backyard landscape. Having a beautiful potting shed is also one way to make your backyard to stand out. 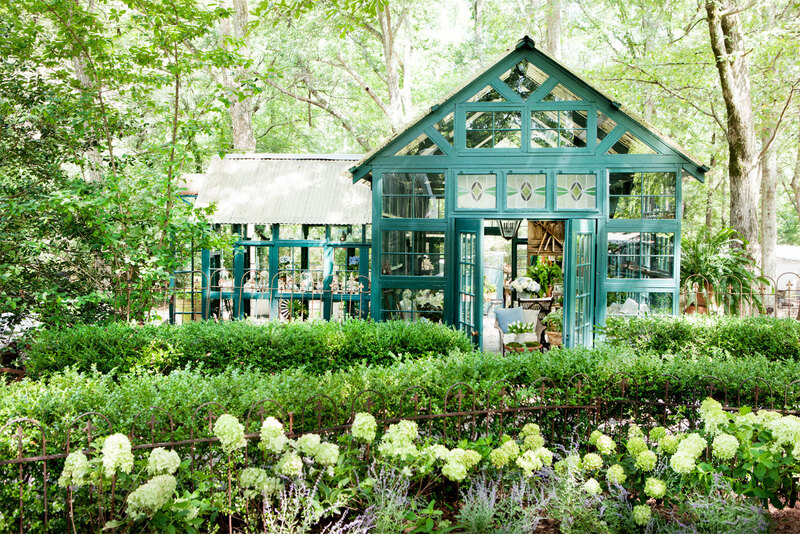 A glass encased potting shed similar to the photo above can be a charming installation in your backyard garden. You can have the shed built or you can make it a DIY backyard landscaping project. Surround your shed with shrubs and flowering plants to make your backyard look even more beautiful. Perhaps, your idea of a backyard landscape is to have a cozy corner where you can relax and read a good book. If so, then take inspiration from this cute backyard. 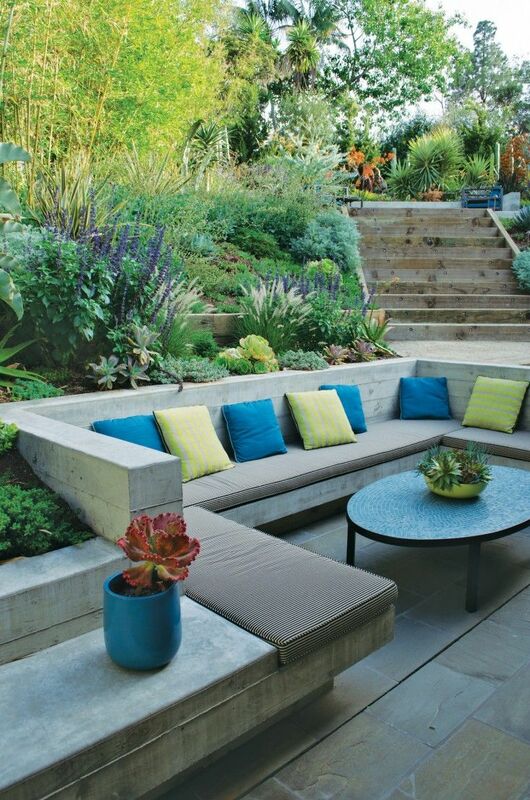 This is one of those simple landscape ideas that rely on the use of sleek furniture pieces. Here, a sleek couch was installed in one corner to create a cozy nook. Trees and shrubs are then grown to give the area a comfortable shade. There is really something inviting about a sunken patio in a backyard. Thus, if you have a sloping yard, this is one of the best backyard landscaping designs that you can take inspiration from. Simply carve out a section in your yard and convert it to a private retreat, similar to the photo above. Aside from installing a cozy seating area, don’t forget to accessorize by adding colorful pillows and some potted flowers too. Of course, installing beautiful lighting can also make the area look even more romantic at night. You can extend the warm feel of the winter season to your backyard by installing fireplace to it. For instance, this open-air living room is just the perfect place to gather your family and friends in winter. On the other hand, you can use the fireplace in summer to display some potted blooms. This backyard design is not only charming, but is highly functional too. 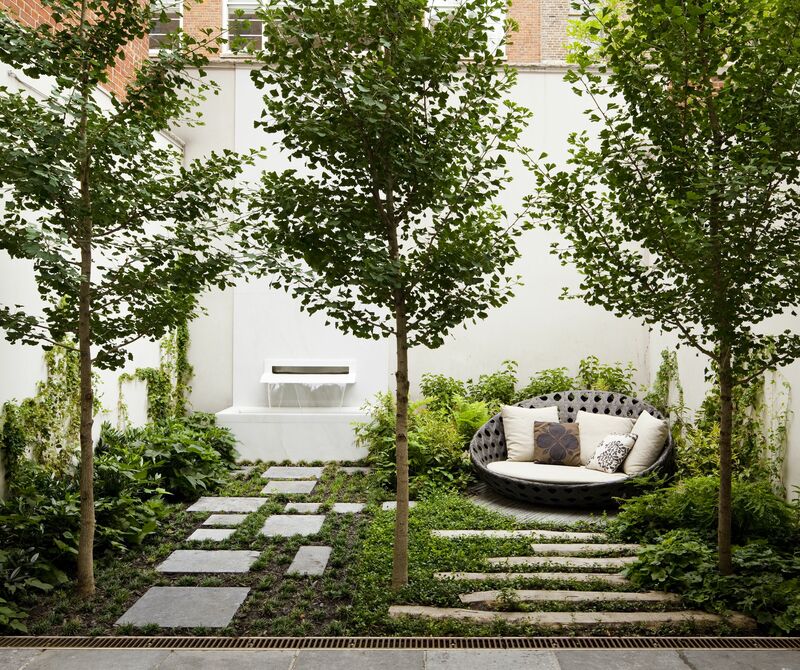 If you’re in need of small backyard landscape ideas, then take inspiration from this design. 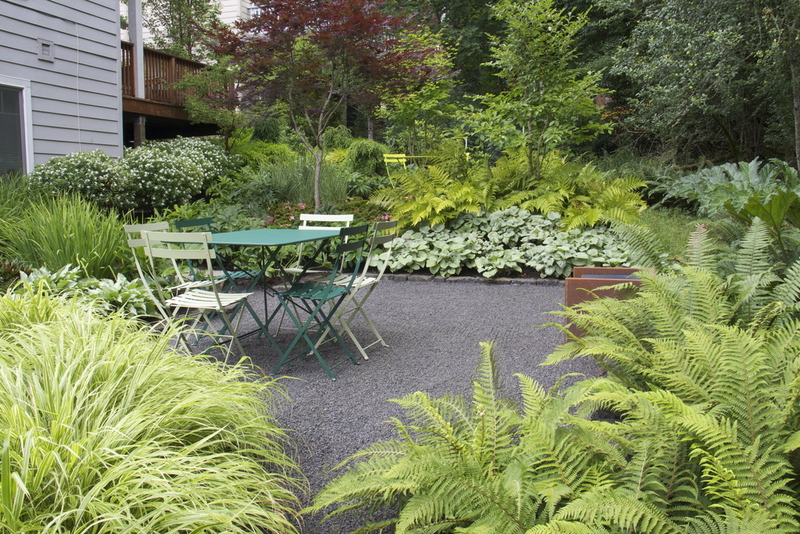 This charming backyard has benefited from the subtle use of various textures of greens. The lush green shrubs and plants provide a feeling of privacy and enclosure in the terrace. This is a perfect solution for when your neighbors are too close. Moreover, a table and chair set in the middle is also a perfect way to entertain guests. A water feature can surely add interest to a small backyard landscape. This is another great idea for those with limited space on their backyard. Building a naturalistic waterfall and pond will add movement and noise. Thus, giving life to your old, small and bored looking yard. You can also have some fishes in the pond to add wildlife to your backyard landscape that will surely be enjoyed by kids. Coming up with a well-planned vegetable garden in your backyard is a pretty economical idea. Depending on the type of vegetables you will grow, this idea should be easy to accomplish. Not only that, it will not cost you lots of money too. In fact, this is one of the cheap backyard landscaping ideas that you can take inspiration from. Simply show up at your local nursery and purchase a variety of crops to grow. Perhaps, you can have a couple of squash, some tomatoes and plenty of herbs. There’s a reason why a lot of people love a Japanese inspired garden design. It’s not only charming, but it’s very relaxing as well. In fact, some of the best spas in the world would take inspiration from Japanese gardens. If you want this design in your garden, all you need is to install a Japanese garden bridge over your backyard pond. Besides, these Japanese bridges are not only related to Japanese themed gardens alone. They can also work well for contemporary backyard landscape design ideas. 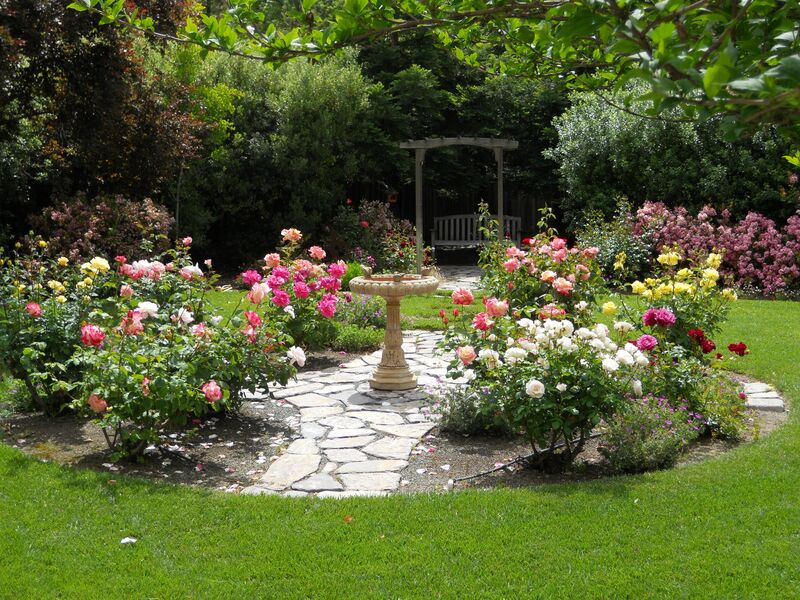 One of the simple landscape ideas is to fill your backyard with lots of flowers. 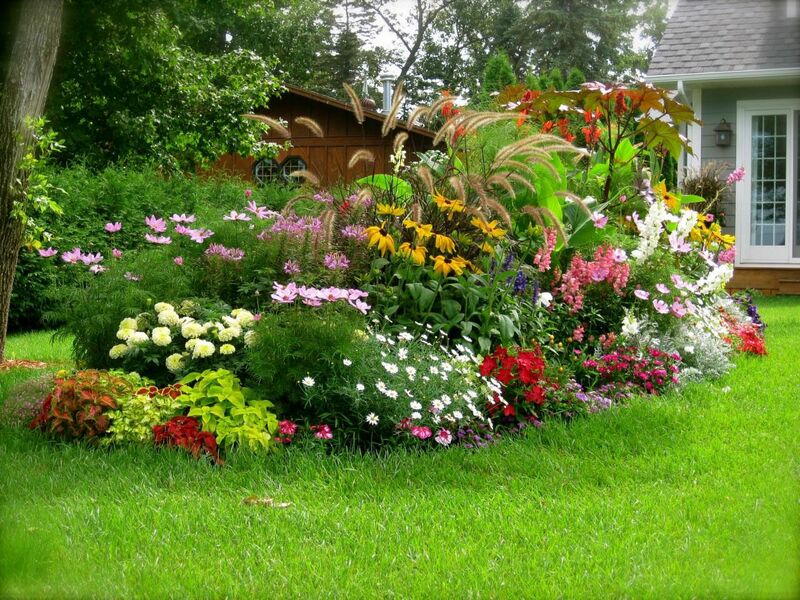 This flower garden can also work well if you have a shady and sloping backyard. Moreover, if you love gardening, then this idea is perfect for you. Simply transform a certain area in your yard to a field of flowers and allocate some of your time each day to tend to your garden. It might take up a lot of your time, but when these flowers start to bloom, it will definitely be worth it. If you want to give your backyard a cheap makeover, then be ready to apply your carpentry skills. Building a wooden decking is a great way to transform your small yard into a warm and inviting space. This is one of those cheap backyard makeover ideas that will require some DIY skills. However, with some effort and time, you will be able to give your backyard a sophisticated look with the use of a few lumber materials. A sunken patio might be perfect for a sloping backyard. However, if you do not have that much money to spend for a sophisticated sunken patio, then this is one of those cheap backyard landscaping ideas that you can take inspiration from. Adding elevated steps on your backyard can add dimension and texture to your landscape. Of course, don’t forget to add an abundant of flowers and plants to prettify the design. 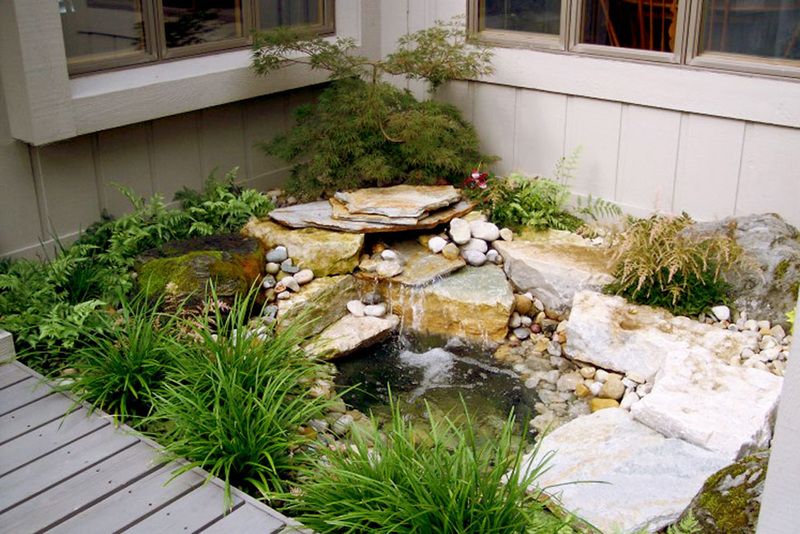 A koi pond is a popular water feature when it comes to backyard landscaping designs. It can serve as a beautiful focal point to your backyard. Furthermore, the pond also gives your backyard a sophisticated and comforting feel. As a matter of fact, having a koi pond can make your backyard feel even more relaxing. Of course, don’t forget to grow some shrubs and lush turf in the surrounding. If possible, install some lighting in your yard for a more romantic evening. You can never go wrong with a Wisteria vine. In fact, if you want your garden to stand out, all you need is to grow wisteria in it. 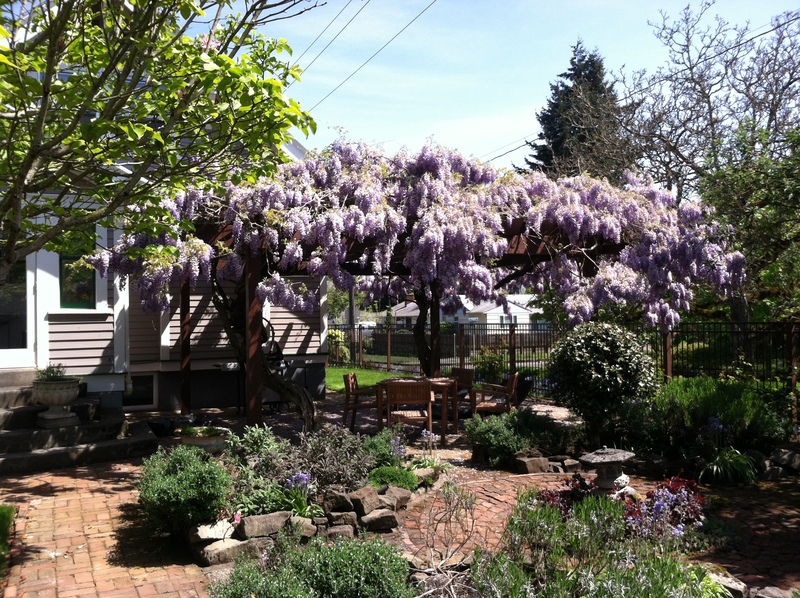 In this pic, a wisteria vine can be seen crawling above a pergola. Unfortunately, you may need to give utmost attention to the care and maintenance of this vine. Being an extremely vigorous plant, the Wisteria can get out of hand if you do not tame it well. Nevertheless, growing this showstopping vine is really worth all the effort and time. Coming up with a floral walkway is also another way to add color into your backyard. Visit your local garden supplies store or a nursery center and look for those colorful flowers that you can grow in your yard. You can grow lots of them in pots and once they start to bloom, bring them outside. Place them on the side of a brick walkway, and you now have a beautiful path leading to your backyard patio. Transform your backyard into a spa with this DIY backyard landscaping design. 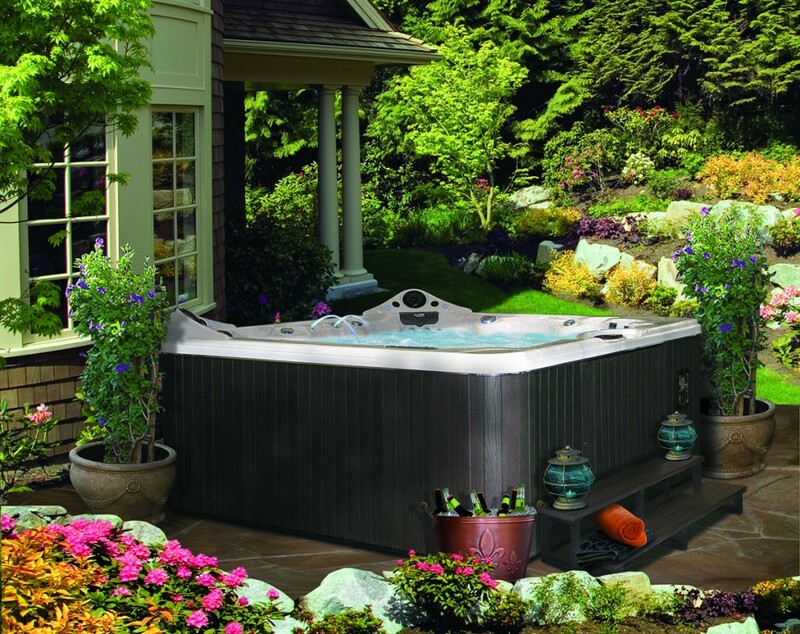 Simply install a ready made Jacuzzi tub which you can buy at any home improvement store. Don’t forget to surround your tub with potted flowering plants for a more relaxing view. Of course, install some lighting so you can have a more relaxing evening spa. Although scented candles will do the trick, a pair of outdoor candelabra is more romantic. The use of wooden elements in designing your backyard is also a great idea. Here, a small spaced backyard has been transformed to a cozy and relaxing retreat. Aside from a wooden deck and furniture set, a wooden divider completes the look. 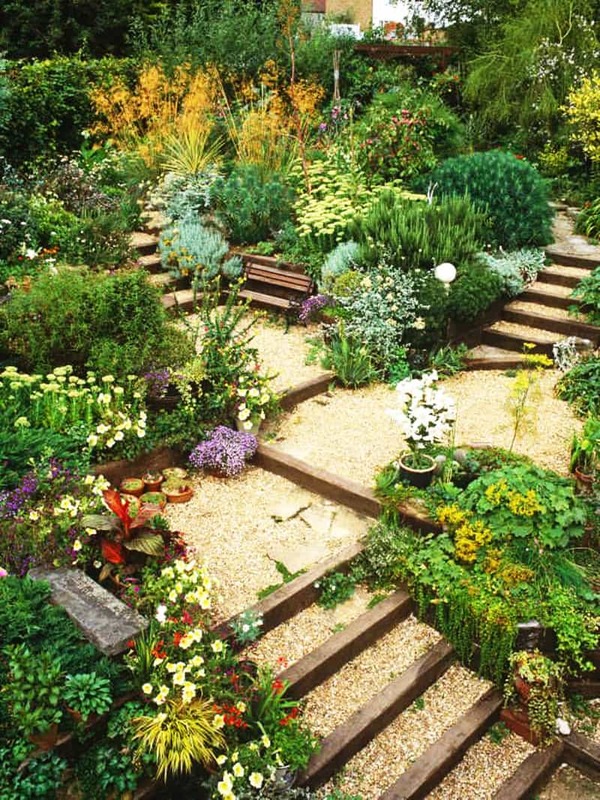 This is one of those small backyard landscape ideas that are inspired by a Japanese garden. As you know, Japanese gardens are more about reflection and meditation. Indeed, there is nothing more relaxing than spending a few moments in this area after a hard day’s work. You don’t really need to spend a lot of money when it comes to your backyard landscaping. The key is to be creative and to come up with a theme as your starting point. Hopefully, these backyard landscaping designs can inspire you to transform your old backyard into a lovely abode.